First let’s talk software – you need an Adobe Creative Cloud Photography Plan if you don’t already have it, which also gives you access to syncing your images to Adobe's Lightroom Mobile apps. There is a bit of potential confusion here, because the naming (and identical pricing) of two of the available plans can lead you to purchase the wrong thing. I would advise you to subscribe to the “Photography Plan (20GB)”, not the “Lightroom CC Plan (1TB)”. The latter does not include Photoshop (which, though not directly related to editing image in Lightroom on the iPad, you will likely want to have access to), and it also includes Lightroom CC desktop app instead of Lightroom Classic (which is the more suitable app for this type of work). Unless you have a specific need for more storage, opt for the 20GB plan. Confused yet? Let me back up for a moment. Presumably for marketing reasons, in late 2017 Adobe decided to take the name of the well-established Lightroom that we have all used for years, and reassign it to a completely new piece of software (rather than come up with some new name for this new app), which led to much confusion among both new and existing users. 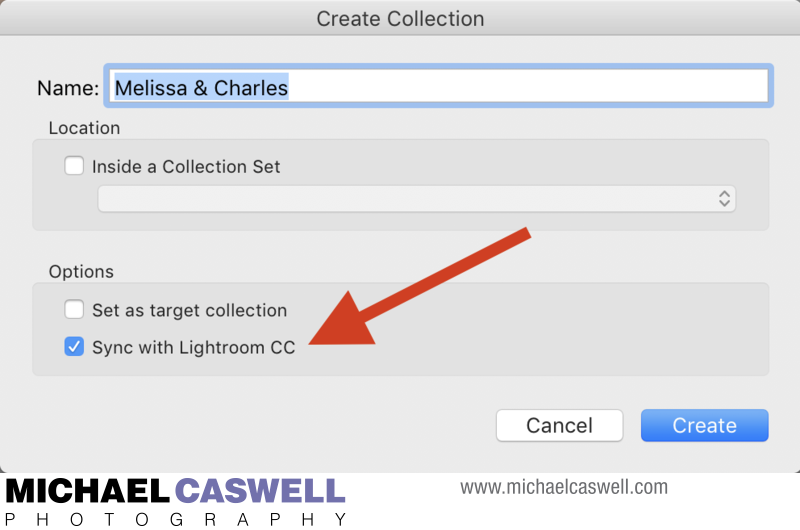 This new app (now called Lightroom CC, hereinafter referred to as LR CC) is Adobe’s “cloud-centric” editing app which functions under the assumption that you want the full RAW files all of your photographs synced to the cloud. 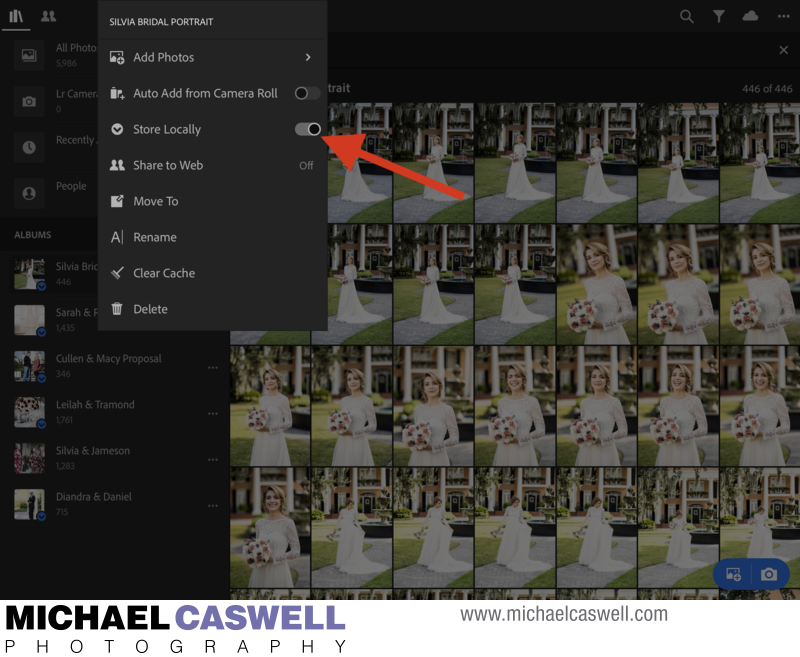 But in my experience, this makes storage and organization too cumbersome for the high volumes of images that professional wedding photographers typically capture. The original Lightroom we all know and love was renamed Lightroom Classic CC (hereinafter referred to as LR Classic), and is the “desktop-centric” editing app. This is the app I suggest you use for this workflow. But wait, if I am editing with the iPad synced through Creative Cloud, don’t I need the “cloud-centric” LR CC? No. LR Classic works just fine for this, which I’ll elaborate on in a bit. The Adobe Photography Plan does include access to both LR Classic and LR CC, but again, the Lightroom CC plan does not give you access to LR Classic or Photoshop, only LR CC. With that settled, let's move on to storage. You’ll notice that for the Photography Plan, there is a 20GB and a 1TB option for storage, but unless you need the added cloud space for some other purpose, 20GB will be perfectly fine, no matter how high your shooting volume is. Why? Rather than full RAW files, LR Classic syncs only Smart Previews to the server. Smart Previews are basically downsampled DNG (RAW) files that serve as proxies for your original images for the purposes of more streamlined editing on mobile devices. So when you make edits on the iPad, you are actually seeing the Smart Preview, but then the information about the changes you've made are synced to the cloud and back down to your computer, where they are applied identically to the originals. At the time of this writing, Adobe does not count synced Smart Previews against your storage quota. In other words, even though at this moment I have about 6,000 images synced to the server, my storage usage is still reported as zero. Even if Adobe changes this policy and starts counting Smart Previews as part of your storage allotment, you quite possibly still won't need more than 20GB, since that's enough for approximately 10,000 images (which, for me, would be more than enough space for the weddings and portrait sessions I need to have synced to the cloud at any given time). Now, one possible exception to the above recommendation of choosing the 20GB plan over 1TB (or more). If, rather than using Smart Previews for iPad editing you would prefer the full RAW (or DNG) files to be synced to the cloud, you'll obviously need a lot more storage space. 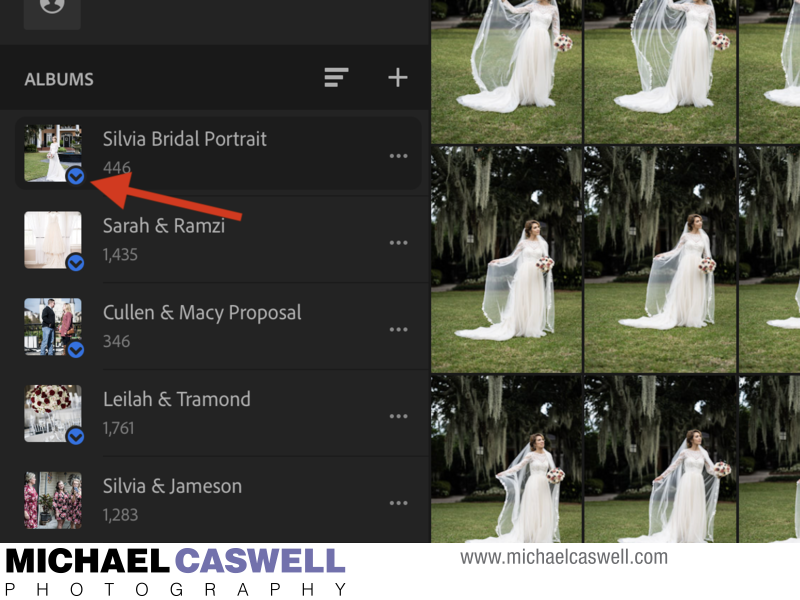 LR Classic is only able to upload Smart Previews, so if you want to go this route, you'll need to incorporate the LR CC app into your workflow (either in addition to, or instead of LR Classic), but I have no direct experience with this. But keep in mind, syncing the full RAW files for every event will take a considerably longer amount of time and will consume much more bandwidth compared to Smart Previews, so unless you have an extremely fast fiber/gigabit internet service with unlimited bandwidth, this will likely complicate the simple, fast, and efficient mobile editing that Smart Previews-based workflow offers. So weigh this choice carefully before you commit to it. I recommend an iPad Pro, mainly for color accuracy, as these models are reportedly factory profiled for accurate color representation. In my evaluations of the various models in recent years, I’ve found the original iPad Pro 9.7”, the subsequently released 10.5”, and the most recent 11” and 12.9” models (with FaceID) to all have a near-perfect match to my calibrated iMac Pro screen, though I was not as impressed by the original 12.9" model (with TouchID). You may, however, be able to get by with a regular iPad, but only the model released in March of 2018. Earlier iPad models had displays that were noticeably too cool in color temperature (which, if used for color correction, would lead you to adjust the white balance on images to be a bit too warm). I discovered that this could be partially compensated-for by enabling the iOS Night Shift feature and tweaking the control a bit, which would make the display slightly warmer and ok for rough adjustments, but still not really accurate enough for editing wedding photographs. But when I tested the March 2018 iPad, I discovered that its display color was much closer to the iPad Pro, so that model could be a more affordable option. But I would still suggest going with the iPad Pro, as the more precise color representation and the increased screen size of all three currently-available models (10.5”, 11”, 12.9”) are beneficial features, and the faster speed is nice as well. The three sizes available let you apply your own requirements in terms of budget and portability. If you go with the 12.9", one nice thing you'll find is that Adobe's programmers didn't simply scale up the app for this larger screen – the user interface elements (sliders, buttons, and other controls) are actually about the same size that they are on smaller iPads, so all of that increased screen real estate goes to show your images larger. LR Mobile is available for Android tablets as well, but I have no direct knowledge or experience as to how reliable the color representation of these various manufacturers' tablet screens would be. For storage size, if you are primarily or exclusively using the device for the type of editing discussed in this article (as well as other basic tasks like web browsing, email, YouTube, and office stuff), 64GB is fine. Only 64GB? Yes. As mentioned above, you will not be storing the full RAW files on the iPad, only Smart Previews (unless you go route of syncing full RAW files to the cloud). While a 64GB iPad might not be enough to store even a single wedding’s worth of full RAW files, it’s plenty for Smart Previews. As a rough guide, expect Smart Previews for every 1000 images to consume about 2GB of storage space on the iPad, which should give you ample space to have the device loaded with about a dozen weddings at a time. If you want to also use the iPad for other storage-intensive purposes like displaying a portfolio of images during client meetings, loading it up with movies to watch while traveling, etc., then consider 256GB or 512GB. If you want to try to implement a workflow that consists of loading full RAW files onto the iPad (briefly mentioned earlier, but not the topic of this article), you'll likely need 512GB, or possibly even the newly available 1TB capacity. If you’re new to the iPad and are not sure how extensive your usage will be, 256GB represents a good balance between ensuring you will not be drastically short on space to work with, without overpaying for excessive (and expensive) storage that you may never use. One caveat to this workflow is that you must use just one catalog file. There are some Lightroom users who advocate creating separate catalog files for every event and portrait session. Similarly, some photographers like to have multiple catalog files based on job dates – for instance, creating a separate catalog file for each month, or perhaps one catalog file for the whole year. If this is the case with you, you’ll need to change that practice to use the Lightroom Mobile workflow efficiently. The reason is that Creative Cloud will only allow one LR Classic catalog file to be designated as being able to sync to the cloud, and changing this designation every time you open a different catalog file will quickly become cumbersome and confusing, defeating the whole purpose. For those who like to keep their RAW files indefinitely, but don’t want the catalog file to grow too large, my suggestion is to, after the editing of the job is finished, and JPEGs have been exported and delivered (and thus the RAW files are no longer needed to be regularly accessed), use the “Export as Catalog” option in LR Classic to offload the images onto a secondary external hard drive for offline storage. You can then delete them from your the main working catalog. 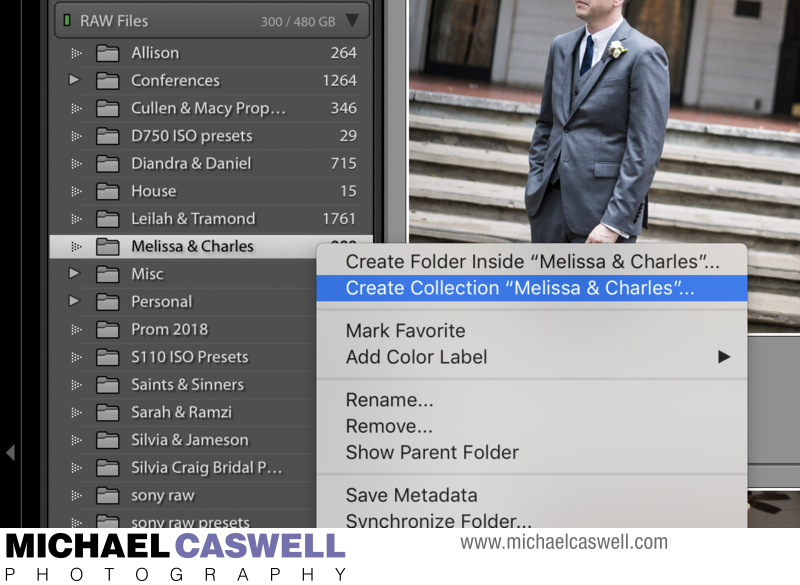 I have maintained a single catalog file for as long as I've been using Lightroom (close to ten years now), constantly adding and removing folders along the way as I shoot new weddings and portraits and finish the editing of previous ones, and I can't recall ever having any problems with the catalog file. I do have Lightroom set to automatically optimize the catalog upon quitting, and I also make frequent backups to multiple locations, just in case. This assumes that you are already familiar with LR Classic and have it up and running, with a single catalog file set up and loaded with images, and that you’ve installed the Lightroom Mobile for iPad app on your iPad (and signed into your Creative Cloud account). Open LR Classic. Ensure that syncing is enabled by clicking on the app name / status bar area in the upper left of the window, and clicking the play button if it says Paused. 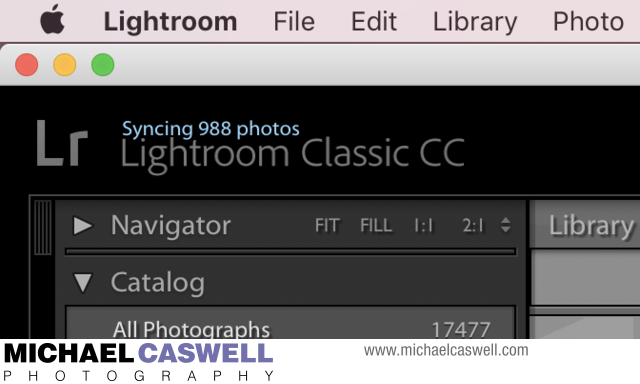 Ensure "Sync with Lightroom CC" is enabled. In the Library module, control/right-click the folder you want to sync with Creative Cloud, and select Create Collection. Creating a Collection is how you designate images to be synced to the cloud. 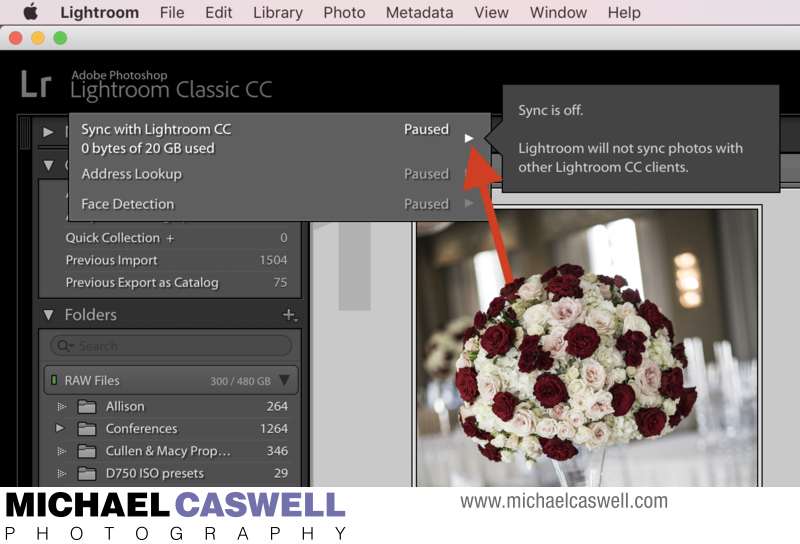 Ensure that the “Sync with Creative Cloud” checkbox is checked, and click OK.
LR Classic will generate the necessary Smart Previews and upload them to the cloud, a process which may take 10-20 minutes or so (maybe more) depending on the number of images to be processed, your computer speed, and your upstream internet connection bandwidth. LR will indicate whenever images are being synced to or from the cloud server. Meanwhile, if you open LR Mobile on the iPad, you’ll see those images start to appear in an Album with the same name as the Collection you created. Important: by default, only thumbnails will be downloaded and stored on the iPad initially, with the Smart Previews (which are required in order to make edits) being retrieved from the server one at a time as you swipe to each image. What this means is that if you now grab your iPad and head off somewhere to work where there is no WiFi available, you’ll find you will not actually be able to edit, because LR Mobile will not be able to download the Smart Previews. If your iPad is a cellular model, or if your iPhone carrier plan allows for tethering, you can of course sync edits and download Smart Previews while away from WiFi in a pinch, but just be aware that this may result in excessive mobile data usage, so use with caution. Downloading the Smart Previews in advance in this manner also speeds up editing even when you're on WiFi, since this image data does not need to be downloaded each time you swipe to the next photo. Turn on Store Locally to enable editing when away from WiFi. This blue arrow icon on an Album thumbnail indicates Stored Locally is enabled. 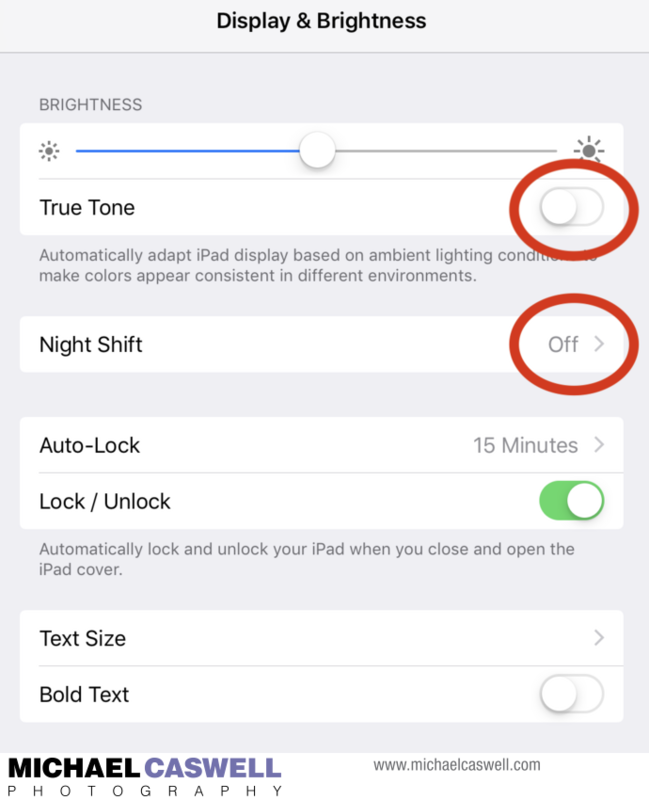 Also important: make sure the Night Shift and True Tone features on the iPad are both off. Night Shift changes the display to a warmer white balance at night time to reportedly reduce eye strain and to help you get to sleep easier, while True Tone constantly monitors the color of the ambient light around you and changes the white balance of display as needed to match it. While these features are useful for general iPad use like reading, emailing, and web browsing, obviously you cannot make accurate color corrections to images when the white balance of your display is not consistent and/or is dramatically warmer than normal. True Tone and Night Shift should be off. Turning both of these off will keep the white balance of your iPad's display unchanged. These settings can also be accessed from the iOS Control Center by long-touching on the Brightness slider. Set your iPad's Brightness at halfway as a starting point, for editing in a typical residential room lighting. While I've found the iPad Pro to have very good color accuracy at this setting, you may need to increase or decrease the brightness to compensate for the amount of ambient light where you are working. As you edit, the metadata representing your changes will be uploaded to the cloud server, and then will be available to other signed-in devices, including Lightroom Classic (if it's open) on the main computer. In some cases, mobile devices will receive these updates in the background, but if you are about to head out of the house with the iPad, it's a good idea to open LR Mobile briefly before leaving to ensure it is synced up (tap the cloud icon in the upper right to check the status). When you have finished editing a job, first ensure that any edits made on other devices have finished syncing to LR Classic. If you have not left the LR Classic app open on the computer, launch it and let it sync the changes from the server. To be certain that syncing is complete, I change the star rating of the final image in LR Mobile, which enables me to confirm at a glance in LR Classic that this latest change has indeed been synced. Presumably at this point, you will no longer need access to that job in LR Mobile (since editing is complete). In LR Classic, right/control-click on the Collection name and select Delete, which will remove them from the cloud server as well as from your iPad and other devices (don't worry, the folder of images will remain in LR Classic until you specifically remove it... you are only deleting the Collection here). Then simply follow your usual post-editing workflow procedures of renaming the images, exporting JPEGs, creating and uploading galleries, etc. 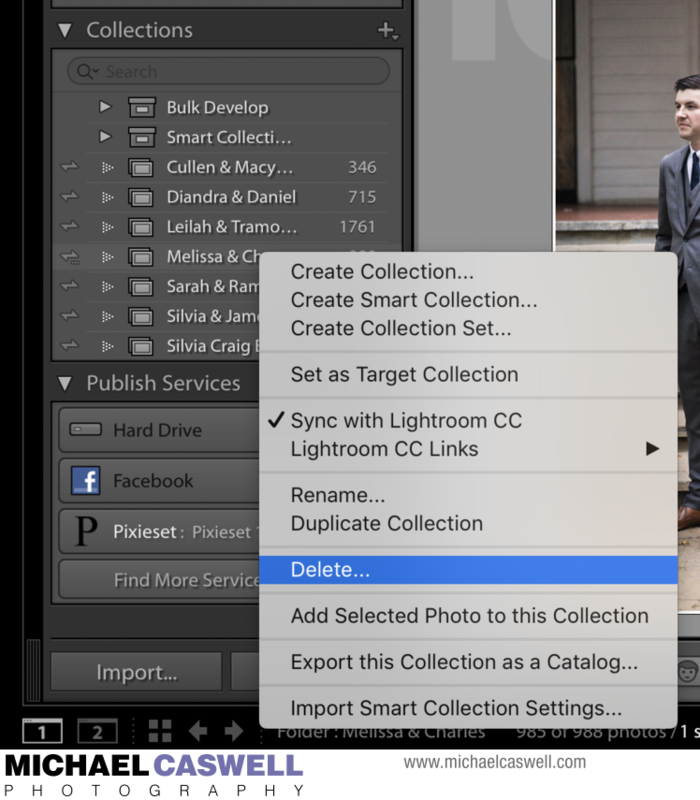 Delete the collection when you no longer need it synced to Lightroom Mobile. Ensure this option is unchecked, to remove the images from the server. The next section explores some tips for working in Lightroom Mobile.